The Eco Leaders at École K.L.O. Middle School are an inspiring group of students. Their science and environment teacher, Michelle Hamilton, due to limited resources to bring students on field trips to local green spaces, has made it a mandate to make their school an educational outdoor green space which, from my observation, has made them some of the most engaged, active, critical, and inspiring pre-teens I have ever encountered. When I was first starting to work with this compelling group of students, a young generation dedicated to saving their currently disappearing world by way of making it more sustainable, my first impulse was to gain their perspective; capture that and share it with their community to help them build their own momentum for their own Environmental actions, for it is truly an inspiring one to watch unfold. In his book, Directing the Documentary, Michael Rabiger says, “perspective is our inner life of ideas and feelings proceeding in counterpoint with our ecological system of outer, visible, and audible events” (59). Rabiger being a documentarian, would likely argue, the best way to share this would be of course through a documentary. And for this, video documentation was what I chose to give these students to share their perspective which I was so fascinated by. With the help of UBC’s Faculty of Creative and Critical Studies as well as the UBCO.TV media centre on UBC’s Okanagan Campus, I was able to get cameras into the hands of each of the students in Michelle Hamilton’s grade eight Environmental Education class where I then taught them how to put together a documenting video piece in small groups. Each of these students was passionate about integrating the natural ecological system we all depend on for survival into their learning and every day lives more effectively. To see this through, each had already been involved extensively in initiatives such as the creek restoration, and a school compost, and gardening with local species of plants on school grounds. I had them document these initiatives on video, incorporating subject and creative elements, to bring out their own points of view on each topic. I had these groups of students use creative storytelling tactics to show, through the lens of their cameras, what they saw in the work they were doing. This gave them the opportunity to creatively integrate themselves with what they were studying about and align their passions accordingly. The videos the students created were very inspiring in both the positivity and commitment they took to the project with, and the resulting videos they had created. These videos ranged from a spoken word set, to a montage, to songs, and a music video based on current social media trends. What these students did was share their perspectives which is what I had set out for them to do but in the process, ended up doing what Helen Nicholson describes as being one key goal of drama in application, “traveling into another world […] which offers both new ways of seeing and different ways of looking at the familiar” (13). 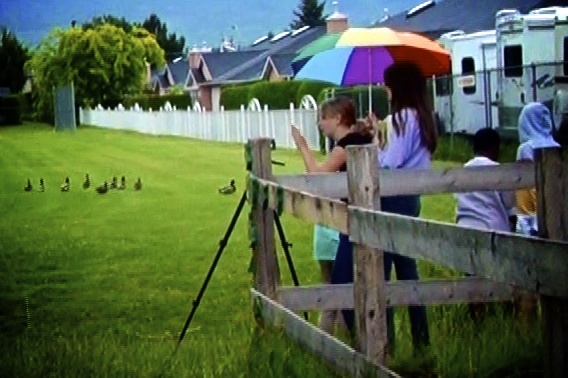 These videos have since been submitted to the BC Green Games, a province-wide science and environment initiative designed to encourage young people to take positive environmental action and share their models for doing it so that they can be applied to other communities.